Five people in the US city of San Francisco have ended a 17-day hunger strike calling for a police chief to be sacked from his job. Dubbed the Frisco Five, they accuse Greg Suhr of heading a racist force following the shootings by officers of three men from ethnic minority groups. They said their cause would be better served by "staying and fighting" than by "starving and dying". They remain in hospital where they were admitted on Friday to be monitored. The five hunger strikers stopped eating in April to protest about the deaths of Mario Woods, Alex Nieto and Amilcar Lopez - all of whom had been shot dead by police. A statement on the Hunger For Justice #Frisco5 Facebook page said that "the whole community" had asked for Sellassie Blackwell, Ilyich Sato, Edwin Lindo, Maria Cristina Gutierrez and Ike Pinkston to end their hunger strike on Saturday so they could "return to the front lines and help shape this movement and the pursuit of justice for the black and brown citizens of San Francisco". "They have been told in no uncertain terms by the community that they are needed here to help fight a corrupt administration and a racist and violent police department," it said. 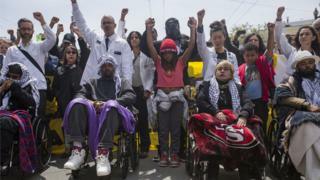 On Tuesday, the Frisco Five, in wheelchairs, along with hundreds of supporters took part in a march to the City Hall demanding to speak to the mayor. Ed Lee was not in his office, but spoke to the hunger strikers by phone on Thursday, saying he had no plans to fire Mr Suhr. More than 30 people were arrested and then released when supporters stormed City Hall on Friday, causing thousands of dollars' worth of damage. There are more than 1,000 fatal shootings by police in the US each year, and those killed are disproportionately African-American.